You might walk “in health” with your spouse for a lifetime, but there are unique challenges at the end of that path. 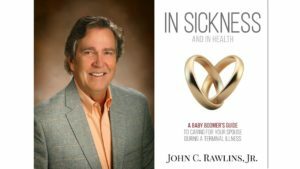 In Sickness presents the advice one Baby Boomer gathered over the six years of his wife’s terminal illness on diverse subjects. Working with Cathy was a very positive experience. Cathy’s knowledge and experience helps guide you through the process of writing a book from conception to publication and all steps in between. You can have a great story, but you’re going to need Cathy to help you make it into a book. To order In Sickness and In Health click here.